My lovely daughter is a big fan of Nutella. When I spotted the big sale of Nutella at our nearby supermarket, I grabbed three large jars back home, without any plans of what to do with them at that moment. I knew she would simply enjoy spreading Nutella on a white toast for tea time or any time throughout the day. It’s no harm to keep more Nutella at home just in case. Over the past few days, it’s been raining non-stop and cleared away the scorching heat in our summer time. It reminded me that it’s a good time to make some tangzhong breads again. 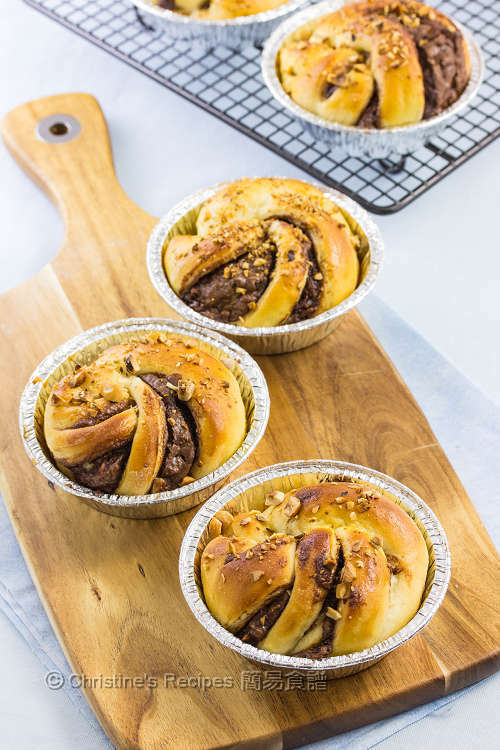 When these nicely curled Nutella buns were out from our oven, I couldn’t wait to taste. Oh my goodness, it’s so delicious and soft. Then I kept some in an air-tight plastic box, chilled in fridge for my daughter to try. Even though the leftovers, wrapped in foil, reheated in a low-temperature oven after two days, were still good as those straight from the oven. It’s all because of the amazing charm made by tangzhong (aka water roux), that’s cooked certain amount of flour with water, then added into other ingredients. It’s absolutely natural and healthy. The bread will be kept soft for a few days. That’s why I’m a die-hard fan of tangzhong breads. To prepare the fillings: Mix two-thirds of the hazelnuts with Nutella. Keep the rest for garnish. Select the “dough” setting. Knead until all ingredients come together. Add the butter. Let the machine finish kneading. The dough should be smooth and elastic and can be stretched to form a thin “membrane”. Let the dough sit inside the machine and finish the 1st round of proofing, until doubled in size. Transfer to a clean floured surface. 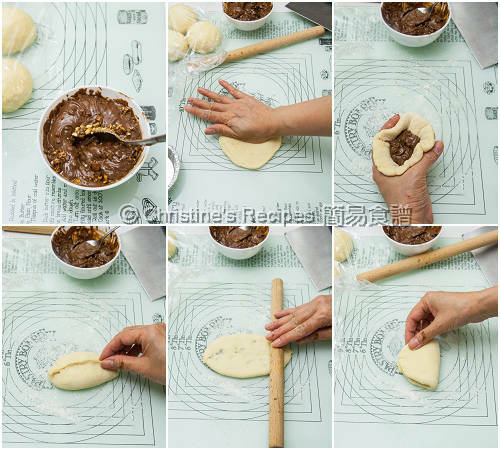 Deflate and divide the dough into 9 equal portions. Knead into ball shapes. Cover with cling wrap, let rest for 15 minutes. Lightly press and flatten each portion. Wrap a heaped spoon of fillings. Tightly pinch the edges. With the seal upward, roll into an oval shape. Fold into half and make 3 to 4 cuts in the middle but don’t cut to the end. Unfold the dough. Hold one end and rotate the other end towards one direction while stretching into a longer tube carefully. Curl it into a round shape tucking the ends under. Place in a mould. Repeat this step with the remaining dough portions and fillings. Cover with a plastic wrap or clean towel. Let proof for 40 minutes, until doubled in size. Preheat oven to 180C/350F. Brush the dough with whisked egg on top. Sprinkle some hazelnuts. Bake for about 15 minutes or until the surface turns golden brown. Remove from the oven. Let cool on a wire rack. Enjoy ! You might knead the dough by hand or with a stand mixer instead. It’s a bit challenging to wrap Nutella fillings. If the weather is too warm, just chill it to a workable condition, yet not too hard to roll it out. Cake flour is a kind of low-protein flour, available at Asian grocers. They look so pretty! Tangzhong bread are always a favourite. Hi Christine, what a yummy recipe :) Supposing that I have trouble finding milk powder, could I substitute water+milk powder with 80 ml milk? The milk powder is to add more fragrance. If it's not handy to get some, use 20 grams of cake flour instead, and replace the water with 80ml milk then. Oh, green tea version, sounds very yummy too. 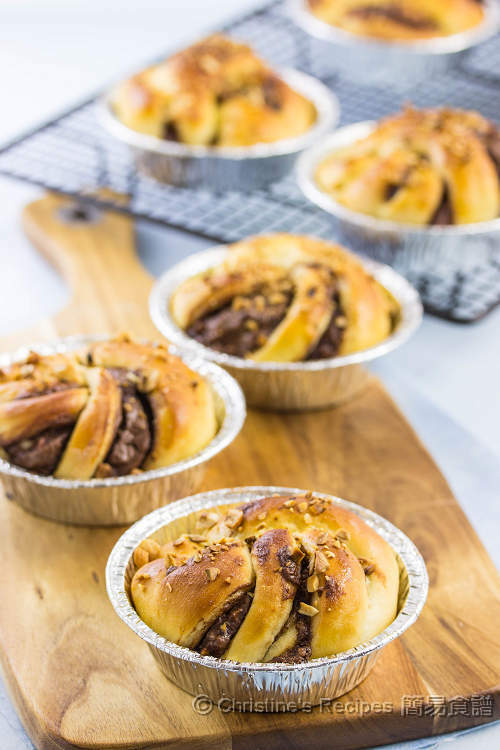 Hi Christine, the Nutella buns look so mouth watering I had to make them yesterday.... However my dough didn't rise at all! I had followed the recipe closely and hand kneaded the dough... I really have no idea why the dough did not rise... :( do you think you know the reason? Wondering if there's something wrong with the yeast. Although the texture of these buns shouldn't be too fluffy, it'd be nice and soft. Normally, you can tell how the outcome will look like with your dough before popping in the oven.If the dough is not soft enough, it could be the yeast, could be not having proofed enough and other possible causes. Hi Christine, thank you for sharing your recipes. I already tried hokkaido milk toast, Japanese style bacon and cheese bread, and it was so delicious. But I have several questions, the things that confusing me. It's about the flour. 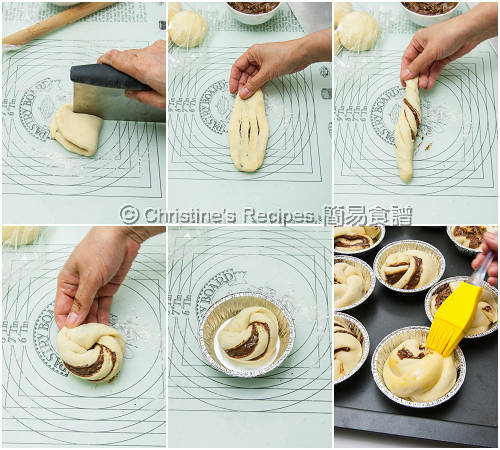 In your recipes, there a recipe that you only need a bread flour, bread flour with tangzhong method, bread flour and cake flour, then bread flour and cake flour with tangzhong method. Can you explain the difference? I'm sure it's about different texture.... But really, it's confusing me. Thank you. Yes, you're absolutely right. It's all about texture. Bread flour is a high-protein flour whereas cake flour is a low-protein flour.Plain flour (all-purpose flour) is in the middle. Bread flour can produce elasticity. But cake flour produces softness. By combining both of them in a certain proportion, you'll get a texture in between or towards one end or the other. It's no right or wrong with using which kind of flours. It depends on what you want and how you like your bread feels like. how should we handle the stored chilled remaining tangzhong for next round of baking? When you store the left-over tangzhong, cover it with plastic wrap, making direct contact with the surface of it to prevent from forming a skin. 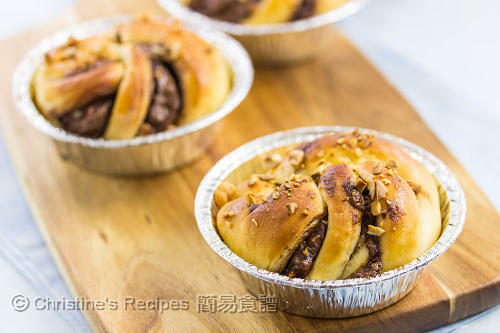 When you're ready to make tanghzong bread, rest the chilled tangzhong at room temperature for at least 10 minutes, then follow the recipe to incorporate it with other ingredients.